Ethiopia Dry Process Yirga Cheffe – Aricha from Sweet Maria’s. The coffee is on its 6th day post roast, and to be honest, I took this coffee beyond what I would have liked. This is a “berry bomb” coffee at lighter roasts, however I probably took this into the first couple of snaps of 2nd crack before opening the door and hitting cool on the Behmor roaster. So, I would say we were probably at FC to FC+. 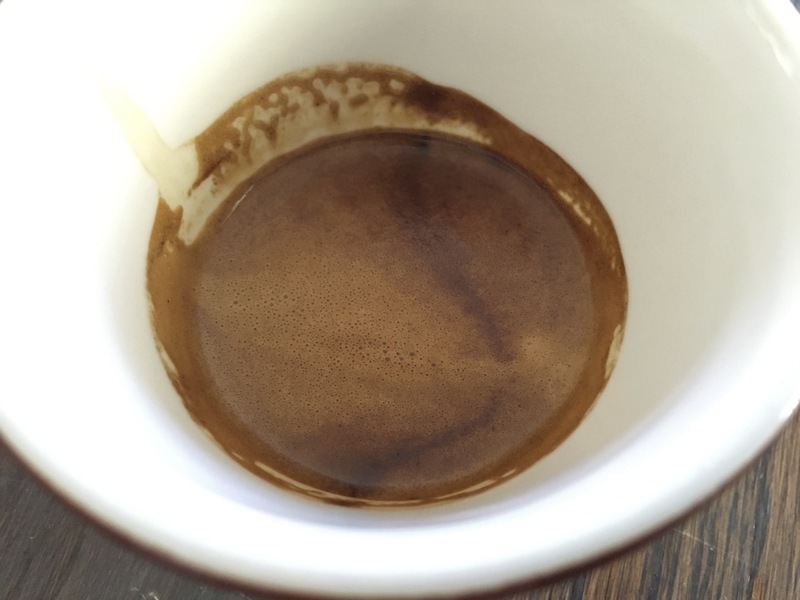 It is a nice coffee at this level, but for a guy who loves fruity espresso, I blew it. 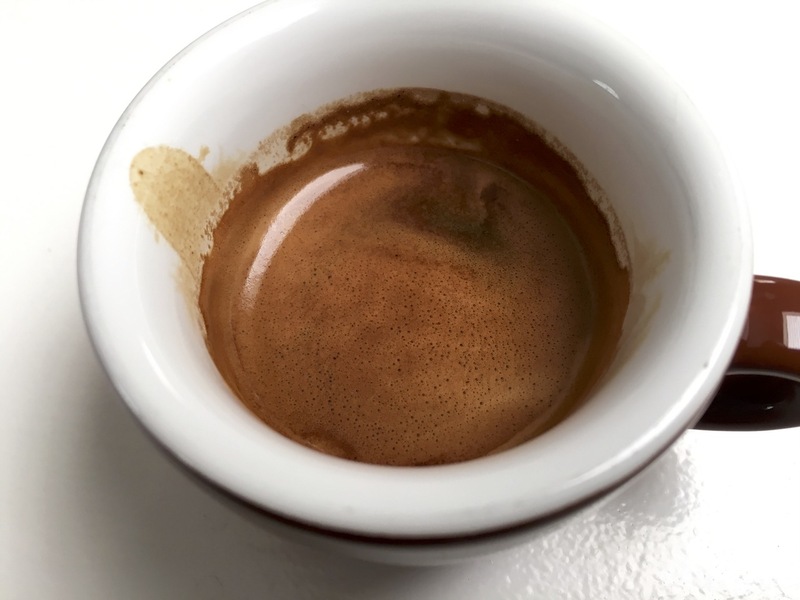 The coffee exhibits mostly cocoa flavors with a little red fruit at the end. While I was not expecting a dramatic difference with this “pre-infusion” setup, I did think there might be a slight improvement in the roundness to the shot. 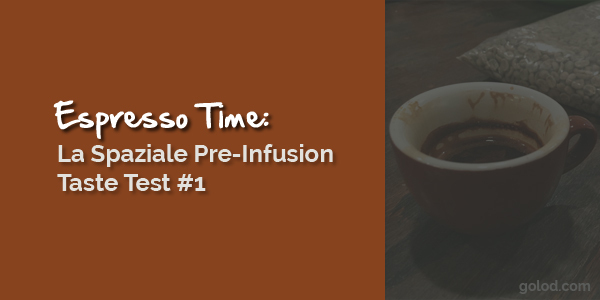 I was also curious if the extraction would go just as well on the non-infusion side. Both shots were 18g in and came out around 19g. Both smelled of dark chocolate with a hint of strawberry on the nose. First sips while they were fairly hot tasted identical. Slightly bitter dark cocoa, a hint of roastiness and a hint of red berries at the close. I let both cool for a couple of minutes before taking my second (and final) sip. This is where it seemed that the pre-infused shot had a slightly more viscous mouth-feel and overall a more rounded flavor. The non-pre-infused shot seemed to be sharper. Not a whole lot, really. Seems like a good reason to try it all again tomorrow morning with the Ethiopia Kaffa Chiri that is ready for duty. I just picked up one of these machines. Is the pump really silent when pulling a shot? I am also considering the pre-infusion kit or making one myself. I just realized you are in Austin…. Happy to meet up anytime. The pump is pretty silent…certainly not in the same league as a vibratory pump like on a Silvia or something of that nature. Come on by and you can check the whole thing out and see if you want to spend the $$ on the PI kit.